Myocardial fibrosis is a common pathophysiological process that is related to ventricular remodeling in congenital heart disease. However, the presence, characteristics, and clinical significance of myocardial fibrosis in Ebstein’s anomaly have not been fully investigated. 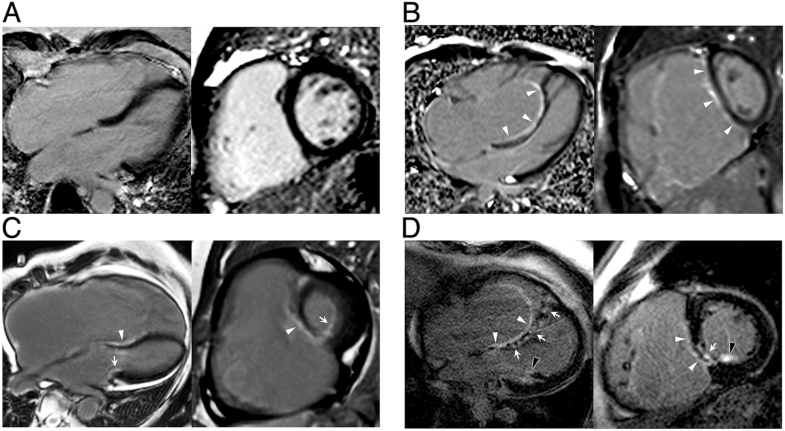 This study aimed to evaluate myocardial fibrosis using cardiovascular magnetic resonance (CMR) late gadolinium enhancement (LGE) and T1 mapping techniques, and to explore the significance of myocardial fibrosis in adolescent and adult patients with Ebstein’s anomaly. Forty-four consecutive patients with unrepaired Ebstein’s anomaly (34.0 ± 16.2 years; 18 males), and an equal number of age- and gender-matched controls, were included. A comprehensive CMR protocol consisted of cine, LGE, and T1 mapping by modified Look-Locker inversion recovery (MOLLI) sequences were performed. 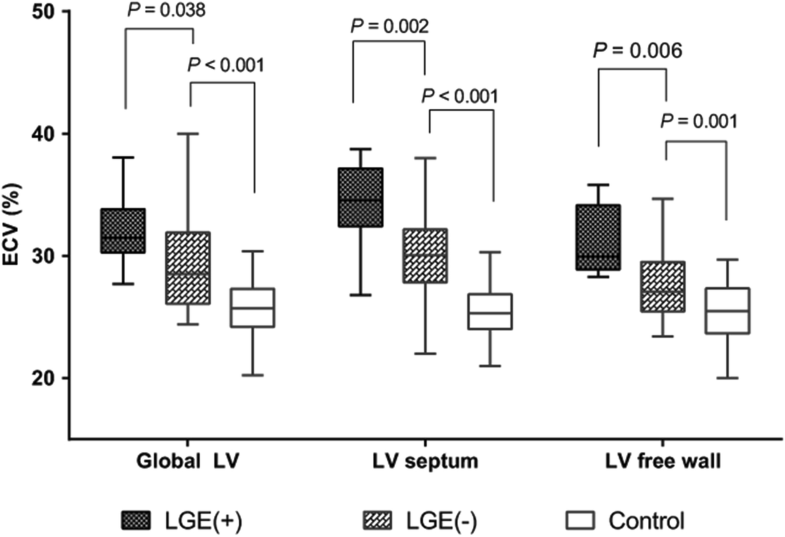 Ventricular functional parameters, native T1, extracellular volume (ECV), and LGE were analyzed. Associations between myocardial fibrosis and disease severity, ventricular function, and NYHA classification were analyzed. LGE was found in 10 (22.7%) patients. Typical LGE in Ebstein’s anomaly was located in the endocardium of the septum within the right ventricle (RV). The LV ECV of Ebstein’s anomaly were significantly higher than those of the controls (30.0 ± 3.8% vs. 25.3 ± 2.3%, P < 0.001). An increased ECV was found to be independent of the existence of LGE. Positive LGE or higher ECV (≥30%) was associated with larger fRV volume, aRV volume, increased disease severity, and worse NYHA functional class. In addition, ECV was significantly correlated with the LV ejection fraction (P < 0.001). Both focal and diffuse myocardial fibrosis were observed in adolescent and adult patients with Ebstein’s anomaly. Increased diffuse fibrosis is associated with worse LV function, increased Ebstein’s severity, and worse clinical status. Ebstein’s anomaly is a rare congenital heart disease. It is considered a right ventricular (RV) myopathy with failure of delamination of the tricuspid leaflets. Ebstein's anomaly is associated with considerable tricuspid regurgitation and the formation of an atrialized right ventricle (aRV) [1–4]. Compromised RV function, in varying degrees, is frequently found in Ebstein's anomaly, and it is believed to be the major cause of heart failure [2, 3, 5, 6]. Compared with the tricuspid valve and RV abnormalities, the left ventricle (LV) of Ebstein’s anomaly is less studied. LV dysfunction was found in 7–50% patients with Ebstein’s anomaly and was associated with worse prognosis after surgery [7–10]. The mechanism of LV dysfunction in Ebstein’s anomaly is yet to be explored. Myocardial fibrosis was found in the left heart of decedents with Ebstein’s anomaly [11, 12]. Limited by the available techniques, to date, it has been difficult to explore the relationship between myocardial fibrosis and ventricular dysfunction in vivo. Cardiovascular magnetic resonance (CMR) is a powerful non-invasive imaging modality to evaluate myocardial fibrosis. Late gadolinium enhancement (LGE) is an established CMR technique that provides accurate quantitation of myocardial replacement fibrosis. Recent advances in CMR native T1 mapping have provided us with a groundbreaking tool for quantification of diffuse myocardial fibrosis. The extracellular volume fraction (ECV) calculated from pre and post contrast T1 mapping images showed a strong correlation with collagen volume fraction histologically obtained from endomyocardial biopsies [13, 14]. Myocardial LGE is strongly related to myocardial viability, ventricular function, and adverse prognosis in patients with ischemic heart disease, dilated cardiomyopathy, hypertrophic cardiomyopathy, and cardiac amyloidosis [15–18]. In congenital heart disease, the existence of LGE located in the RV outflow tract is associated with the occurrence of ventricular tachycardia in patients with repaired Tetralogy of Fallot . T1 mapping also revealed diffuse fibrosis in repaired Tetralogy of Fallot and pulmonary hypertension [20, 21]. With the availability of these techniques, we are now able to study myocardial fibrosis and its significance in patients with Ebstein’s anomaly. Therefore, in the present study, we employed LGE and T1 mapping techniques to quantify focal and diffuse myocardial fibrosis in patients with Ebstein’s anomaly, and to investigate their correlations with the severity of Ebstein’s anomaly, ventricular function, and clinical status. Consecutive patients with unrepaired Ebstein’s anomaly referred to our institution for clinical evaluation gave their consent and were enrolled into a registry since June 2013. All patients received a comprehensive evaluation including a detailed medical history, physical examination, oxygen saturation test, routine blood examination (including serum creatine), electrocardiography, echocardiography, and CMR imaging. Patients in our registry database from June 2013 to Oct 2016 were reviewed and patients with complete data sets and those older than ten years of age were included in the study. Exclusion criteria were as follows: 1) Contraindications to contrast-enhanced CMR; 2) other coexisting cardiomyopathy, such as hypertrophic, restrictive, or infiltrative cardiomyopathy; 3) a history of known coronary heart disease or myocarditis; 4) other complex congenital cardiac anomalies (e.g., congenitally corrected transposition with Ebstein’s anomaly); 5) CMR image quality was too poor to analyze due to significant arrhythmia or difficulty with breath-holding. Patients were grouped into Carpentier’s classification of types A to D, based on the mobility of the tricuspid leaflet and the RV shape and contractility on echocardiography . An equal number of age- and gender-matched subjects were included as controls. Healthy adults with no documented cardiovascular diseases or other major illnesses, and with normal echocardiograms, were recruited as volunteers. Subjects younger than 18 years old were selected for CMR examination to screen for myocarditis. Subjects were included as controls if all clinical data, routine blood work, electrocardiography, echocardiography, and CMR examination excluded cardiovascular disease. All patients and controls (or their parents if a subject was younger than 18 years old) gave written informed consent for their data to be included in this study. CMR was performed on a 3 T scanner (Magnetom Tim Trio, Siemens Healthineers, Erlangen, Germany) with using a 32-channel phased-array cardiac coil. All images were acquired with electrocardiogram (ECG)-gated breath-hold technique. All patients were scanned according to the standard imaging protocol for Ebstein’s anomaly . The protocol consisted of stacks of balanced steady-state free-precession (bSSFP) cine images acquired in the three long-axis (two-, three-, and four-chamber) views, consecutive short-axis views covering the LV from base to apex (TR/TE 3.4 ms /1.3 ms, flip angle 50°, FOV 300 × 340 mm, matrix size 256 × 144, slice thickness 8 mm), and consecutive axial cine bSSFP images covering the whole heart extending from the pulmonary bifurcation to just below the diaphragm. LGE images were acquired using a T1-weighted inversion recovery turboflash sequence 10 to 20 min after bolus contrast injection (Gadopentetate dimeglumine, 0.15 mmol/kg, Bayer HealthCare Pharmaceuticals, Wayne, New Jersey, USA) in the same planes. T1 measurements were performed by using a Modified Look-Locker Inversion Recovery sequence (MOLLI) at the LV basal-, mid- and apical- levels, with the following parameters: non-selective inversion pulse, bSSFP single shot readout with 35° flip angle, minimum inversion time 110 ms, inversion time increment 80 ms, TR/TE of 2.9/1.12 ms, FOV of 360 × 272 mm, matrix size of 256 × 144, Voxel size of 2.1 × 1.4 × 8 mm3 and slice thickness of 8 mm. The inversion time for each patient was chosen at the time of scanning from the TI scout images, with three heartbeats for recovery between each experiment. Native T1 measurements were acquired before injection of gadolinium, with an imaging scheme of 5(3)3), and post contrast T1 measurements were repeated in the same short-axis slices 10–15 min after the administration of gadolinium with a scheme of 4(1)3(1)2. The hematocrit was tested within 24 h of CMR scanning for ECV calculation. CMR images were analyzed using a commercially available software package (QMass® 7.6, Medis, Leiden, The Netherlands). Biventricular volume and function were obtained by tracing epicardial and endocardial contours manually on both end-diastolic and end-systolic phases. The LV volume, function, and mass were measured based on the consecutive short-axis slices. RV volume and function were derived from the axial views, as described in previous studies [1, 24]. All volumetric parameters were indexed to body surface area (BSA). The tracing method for the chambers was similar to the previous description by Fratz et al. [2, 25]. A line along the tricuspid leaflets was used to segment the aRV and the functional right ventricle (fRV). The fRV is defined as the part of the RV distal to the tricuspid leaflets. The border demarcating the aRV and morphological right atrium (RA) is defined as the curved line along the presumed tricuspid valve annulus, from the free wall attachment of the anterior tricuspid valve leaflet to the point of presumed septal leaflet attachment . The trabeculae and papillary muscles were included in the ventricular blood pool. Statistical analysis was performed using SPSS 17.0 (SPSS Inc., International Business Machines, Armonk, New York, USA). Numerical data in normal distribution were expressed as the mean ± standard deviation (SD), or else were expressed as the median with the interquartile range. Continuous data were compared using a paired t-test. Categorical data were expressed as frequencies and compared using a χ2 test or the Fisher’s exact test as appropriate. Correlations between variables were analyzed by using Pearson’s or Spearman correlation analyses. Univariable factors related to the ECV at p < 0.1 were included in the multivariate stepwise regression analysis. Statistical significance was defined as P < 0.05. Ultimately, the Ebstein’s anomaly registry database comprised data from seventy-eight patients. Patients were excluded from the study because of: age < 10 years (n = 12), no contrast was used (n = 2), poor image quality caused by due to persistent atrial fibrillation or unable to breath hold (n = 10), and T1 mapping not performed (n = 10). The remaining 44 patients were included in the study. The mean age of the patients was 34.0 ± 16.2 years (range 10–60) years. Seven patients were between 10 and 18 years. Age, gender and BMI were well balanced between patients and the healthy control groups. Among the 44 patients, 29 (65.9%) had an atrial septal defect or patent foramen ovale. Tricuspid regurgitation was graded as severe in 32 (72.7%) and moderate in 12 (27.3%) patients (Table 1). LV end diastolic volume (EDV) index was reduced in Ebstein’s anomaly patients (68.3 ± 16.8 vs. 79.0 ± 17.1 ml, P = 0.007) (Table 2). LV ejection fraction (EF) and LV mass index in Ebstein’s anomaly was decreased (52.8 ± 7.6%, vs. 60.6 ± 3.7%, P < 0.001; and 39.2 ± 9.1 g/m2 vs. 45.2 ± 11.1 g/m2, P = 0.004, respectively). LVEF was reduced (< 50%) in 34.1% (n = 15) of the Ebstein’s anomaly patients. The LV mass to volume ratio was not significantly different from the control group. Both total and fRV EDV indices and RV end systolic volume (ESV) index were significantly increased compared with those of the controls. The fRV EF in Ebstein’s anomaly was significantly reduced (P < 0.001). LGE was seen in 10 out of 44 (22.7%) Ebstein’s anomaly patients. The typical LGE pattern was linear or patchy localized within the RV subendocardium of the basal septum (Fig. 1). Only one Ebstein’s anomaly patient showed focal transmural LGE in the basal septum and posteromedial papillary muscle (shown in Fig. 1). No remarkable LGE was seen in the LV free wall. In Ebstein’s anomaly patients with LGE, the indexed fRV EDV and ESV were significantly larger than those patients without LGE (both P value < 0.01). The fRV EF was lower in patients with LGE than without. The aRV volume was also significantly larger in the LGE-positive group than the LGE-negative group. Ebstein’s anomaly severity evaluated by the total R/L-volume index was more severe in patients with LGE than without LGE, while the SI was not significantly different between these two groups. Patients with LGE also had a higher NYHA functional class and lower oxygen saturation at rest than patients without LGE (P = 0.011 and 0.042, respectively). The LV volume and the LV EF were lower in patients with LGE; however, the difference was not significant. All data are shown in Table 3. 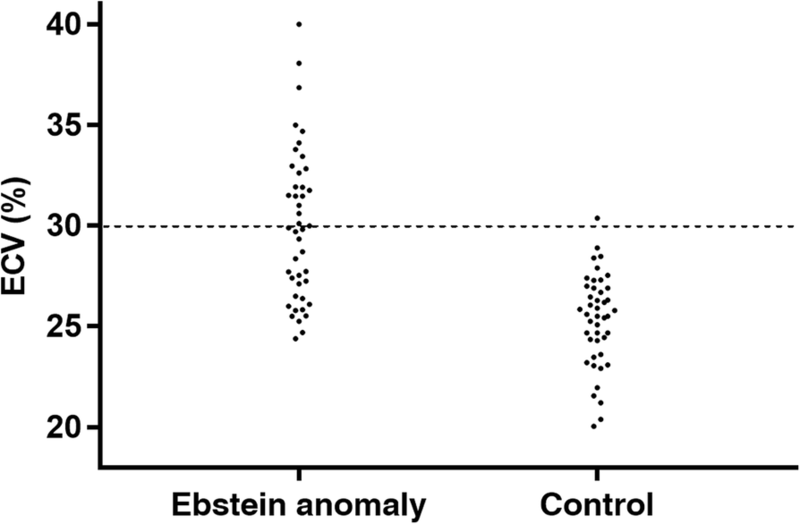 The native T1 was higher but not statistically significant in patients with Ebstein’s anomaly. The average myocardial ECV was significantly increased in patients with Ebstein’s anomaly (P < 0.001). The septal ECV was higher than that of the free ventricular wall in Ebstein’s anomaly patients and free wall ECV was significantly higher than that of the controls (P < 0.001). Twenty (45.5%) patients had an ECV higher than 30%, which is above the upper limits of normal. Except for one a-60-year old, all subjects in the control group had an ECV less than 30%. In patients with a higher ECV, the Ebstein’s anomaly severity index, NYHA class and tricuspid regurgitation were significantly worse than in patients with a normal ECV. The LVEF was much lower in Ebstein’s anomaly patients with a higher ECV than those with a normal ECV (Table 4). The hematocrit was observed to be lower in patients with higher ECV, while no linear correlation was present between the hematocrit and the ECV of the LV myocardium. To explore the relationship between LGE and the ECV, we compared ECV between Ebstein’s anomaly patients with and without LGE. Figure 2 shows that the global ECV was higher in Ebstein’s anomaly patients with LGE than patients without LGE (P = 0.038). It is important to recognize that the ECV in patients without LGE was still significantly higher than that of the controls. The same trend was found (Fig. 2) when the ECV was analyzed separately in the septum versus the free wall. Individual global ECV values in the EA and control groups are shown in Fig. 3. Among all variables, the ECV of the LV myocardium was significantly correlated with NYHA class, tricuspid regurgitation severity, the LV ESV index, the LV EF, the fRV EDV index, the fRV ESV index, and the fRV EF (Table 5). Moreover, we found that the ECV of the LV myocardium had a moderate correlation with the Ebstein’s anomaly severity (severity index: r = 0.392, P = 0.009; Total R/L-volume index: r = 0.612, P < 0.001). Multivariate correlation analysis showed that ECV was independently correlated with LVEF. To the best of our knowledge, this is the first study to investigate diffuse myocardial fibrosis in Ebstein’s anomaly using CMR. The main findings are: (1) both focal myocardial fibrosis and diffuse myocardial fibrosis were detected by CMR in Ebstein’s anomaly patients. (2) Diffuse myocardial fibrosis was more common than focal myocardial fibrosis in Ebstein’s anomaly, and both were associated with the severity of Ebstein’s anomaly. (3) Diffuse myocardial fibrosis demonstrated by T1 mapping was closely associated with LV dysfunction. Ebstein’s anomaly has a wide spectrum of clinical manifestations, from early death in neonates to mild symptoms surviving into adulthood . Heart failure is one of the common symptoms in adult Ebstein’s anomaly, which is a result of biventricular dysfunction [7, 29–31]. LV dysfunction was observed in previous studies and is considered a high-risk factor for mortality after surgery and long-term survival [10, 32]. In Ebstein’s anomaly, LV dysfunction was considered as a consequence of compression caused by a dilated RV and abnormal septal motion . A recent study further corroborated LV dysfunction in Ebstein’s anomaly with LV regional irregularity and the effect of RV longitudinal contraction. However, these mechanisms do not adequately explain why in some patients, postoperative LV dysfunction persisted and was associated with suboptimal survival . The finding of LV myocardial fibrosis in Ebstein’s anomaly provides another perspective on this question. In early studies, myocardial fibrosis was found in ex-vivo hearts of patients with Ebstein’s anomaly, in which histopathological examination demonstrated myocardial fibrosis existed in the fetus and neonate. Interstitial fibrosis was more common in both the RV LV and sporadic replacement myocardial fibrosis also existed [33–35]. Whether or not myocardial fibrosis is an intrinsic property or an acquired characteristic secondary to abnormal hemodynamics in Ebstein’s anomaly is still controversial . Only one study showed that the heart in adult Ebstein’s anomaly patients had interstitial myocardial fibrosis in both ventricles, while very mild myocardial fibrosis was shown in neonates. Due to the limited specimen from autopsies, it is very difficult to confirm detailed mechanisms and characteristics of myocardial fibrosis in Ebstein’s anomaly. In the present study, both LGE and elevated ECV were observed in Ebstein’s anomaly patients. The typical LGE pattern found in this study was mostly localized in the endocardium of the aRV septum. This finding was in accordance with a previous case report . In one case, mid myocardial wall LGE (non-ischemic pattern) was observed in the basal to mid septum. In contrast to LGE, which was only found in a minority of Ebstein’s anomaly patients, interstitial fibrosis, as evidenced by a mean LV ECV elevation greater than the upper two SD limits of the control ECV, was demonstrated in more than 45% of patients. This finding was in line with previous autopsy results . Both LGE and elevated ECV were related to the severity of Ebstein’s anomaly and ventricular dysfunction in this group of Ebstein’s anomaly patients. This finding emphasizes the importance of focal and diffuse myocardial fibrosis in ventricular remodeling in Ebstein's anomaly. LV remodeling was related to Ebstein’s anomaly severity, which demonstrated a close RV-LV interaction [37, 38]. Furthermore, the relationship between the severity of Ebstein’s anomaly and LV ECV also suggested the impact of an abnormal RV on LV myocardial remodeling . The inverse relationship between an elevated LV ECV and LV function found in Ebstein’s anomaly patients was observed in dilated cardiomyopathy . LV dysfunction in Ebstein’s anomaly has been considered to result from chronic hemodynamic under-filling of the LV and is possibly related to myocardial cell degeneration. The present study provided evidence for diffuse myocardial fibrosis, which could be an important contributor to biventricular dysfunction in Ebstein’s anomaly. LV dysfunction is a high-risk factor in Ebstein’s anomaly and is associated with higher mortality after surgery . Preservation and reversal of LV dysfunction in Ebstein’s anomaly could be a potential treatment target. In patients with mild or asymptomatic Ebstein’s anomaly, indications for surgery include deterioration of ventricular function, persistent enlargement of the heart, exercise intolerance, and arrhythmia . The value of CMR detection of myocardial fibrosis in Ebstein’s anomaly in decision-making for surgical treatment requires further study. In a study on aortic valve stenosis, an elevated ECV persisted for at least six months after aortic valve replacement surgery . Earlier intervention might be necessary to reverse myocardial remodeling. In our study, ECV was also associated with clinical and imaging-based ventricular function. Thus, ECV is a potential imaging marker for risk stratification in Ebstein’s anomaly patients. Future CMR evaluation for Ebstein’s anomaly should not only include volume and function analysis, but also consider myocardial tissue characterization using LGE and ECV. There are several limitations to our study. First, the present study consisted of both adolescent and adult patients, and does not represent the entire Ebstein’s anomaly spectrum. Second, the ECV of the RV myocardium was not quantified because the RV free wall was too thin in Ebstein’s anomaly for accurate assessment. Third, the cross-sectional study design limited the ability to determine the impact of myocardial fibrosis on the long-term prognosis of Ebstein’s anomaly. Our study indicated that further longitudinal observation is needed to clarify the impact of myocardial fibrosis and remodeling in Ebstein’s anomaly patients. Focal and diffuse myocardial fibrosis assessed by LGE and ECV were observed in Ebstein’s anomaly patients. The elevated fibrosis was associated with worse LV function, greater disease severity, and reduced clinical status in Ebstein’s anomaly patients. LGE or ECV may serve as imaging markers for the severity of Ebstein’s anomaly. Further studies are needed to assess the prognostic significance of these findings. Dan Yang and Xiao Li contributed equally to this work. D Yang, X Li and YC Chen: contributed substantially to the conception and design of the study, recruitment of subjects, analysis, interpretation and drafting the manuscript; JY Sun and W Chen, contributed substantially to CMR data acquisition and analyses, interpretation and generation of T1- and colored T1-maps; Andreas Greiser and TJ Zhang contributed to interpretation and generation of T1 mapping;Y Luo,H Liu and K Wan contributed to data acquisition and recruitment of subjects; Y Han contributed to study design and critically revised the manuscript; YC Chen participated in the design and coordination of the study and critically revised the manuscript. All authors read and approved the final manuscript. This work was supported by two grants from the National Natural Science Foundation, People’s Republic of China (No. 81271531 and No. 81571638). All data generated or analysis during this study are included in this published article. The study was approved by the Clinical Trial and Biological Ethics Committee of Sichuan University, and all patients provided written informed consent. The study of the healthy subjects was approved by the Clinical Trial and Biological Ethics Committee of Sichuan University, and all healthy subjects provided written informed consent. Written informed consent was obtained from the patient (or guardian) for publication of their individual details and accompanying images in this manuscript. The consent form is held by the authors/the authors’ institution and is available for review by the Editor-in-Chief. Dr. Chung is the investigator of Shenzhen Institutes of Advanced Technology. Andreas Greiser and Tian-Jing Zhang are the investigators on a cooperative Research and Development Agreement with Siemens. The remaining authors declare that they have no competing interests.